Growth Habit: Erect, up to 80 cm. Leaves alternate, diamond-shaped, margin undulating, small hairs on both surfaces, heavily veined. Stem many branched with longitudinal ridges, few hairs. Type of Plant: Black Nightshade is an annual plant, germinating mostly in spring and growing throughout summer and autumn. This plant is often mistaken for Deadly Nightshade (Atropa bella-donna), however Deadly Nightshade does not occur in Tasmania. Flowers: White flowers with yellow centre. Cotyledons: Oval, apex pointed, short hairs on margin and petiole. Fruit/Seed: Fruit a green berry, turning black when ripe. Dispersal: The fleshy fruits are often eaten by birds, which then release the seeds far from the parent plant. 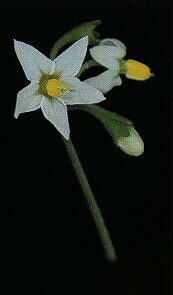 Distribution: Black Nightshade is common throughout Tasmania in a range of habitats including crops, gardens, roadsides and refuse areas. Status: Solanum nigrum is not a declared weed under the Noxious Weeds Act 1964. Black nightshade can be very competitive in crops and in some instances, the fruits may contaminate harvesting. In waste or run-down areas the plants may become quite large and cover a lot of land. At certain stages of growth the plant may contain glyco-alkaloids which may cause poisoning in animals, although fatalities are very rare. Manual removal by hand or hand tools is an easy way to remove black nightshade, particularly small patches in gardens. Mulching is an excellent method to prevent germinating seeds from establishing. Mechanical cultivation can be used to disrupt the root system and can be useful if carried out deep enough. Several herbicides are registered for use in Tasmania including simazine, chlorthal, oxyflurofen and glyphosate. N.B. The herbicides mentioned on this documents may not necessarily be registered for use on the plant referred to.